AAAI has reserved a block of rooms at the Omni William Penn Hotel at reduced conference rates. Space is limited. Refer to group name "AAAI HCOMP 2014" when making phone reservations. Reservation requests received after the cut-off date will be based on availability at the Hotel's prevailing rates. Reservations should be made directly with the Omni William Penn through one of the methods listed above. Rate is per room, per night, excluding applicable state and local taxes. Rooms must be guaranteed by a major credit card. Cancellations made within 24 hours of arrival, or early departures, will forfeit one night's room and tax. 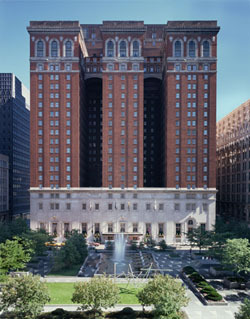 In offering the Omni William Penn Hotel, the Pittsburgh International Airport, and all other service providers (hereinafter referred to as "Supplier(s)" for the AAAI Conference on Human Computation and Crowdsourcing, AAAI acts only in the capacity of agent for the Suppliers that are the providers of the service. Because AAAI has no control over the personnel, equipment or operations or providers of accommodations or other services included as part of the HCOMP-14 program, AAAI assumes no responsibility for and will not be liable for any personal delay, inconveniences or other damage suffered by conference participants which may arise by reason of (1) any wrongful or negligent acts or omissions on the part of any Supplier or its employees, (2) any defect in or failure of any vehicle, equipment or instrumentality owned, operated or otherwise used by any Supplier, or (3) any wrongful or negligent acts or omissions on the part of any other party not under the control, direct or otherwise, of AAAI.